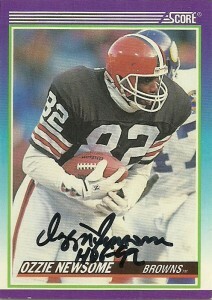 Cards: Upper Deck Legends 1997, Action Packed Whizzer White Award 1991. I had been watching this miniseries on NFL Network called “Full Color Football” and it briefly mentioned Gale and a few other players from the NFL before the AFL merger. After doing a search on the former great, I found his website and found the fee ‘reasonable’ in order to add him to my collection. 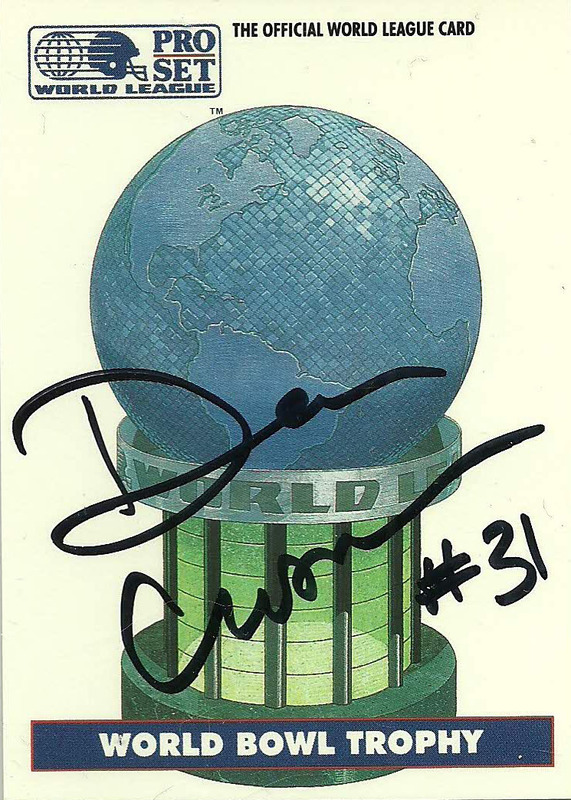 I used to shrug at the idea of paying players for autographs, but as years have passed and also I realize the time it takes, the inconvenience it may cause, and how it may provide some players an income they need. 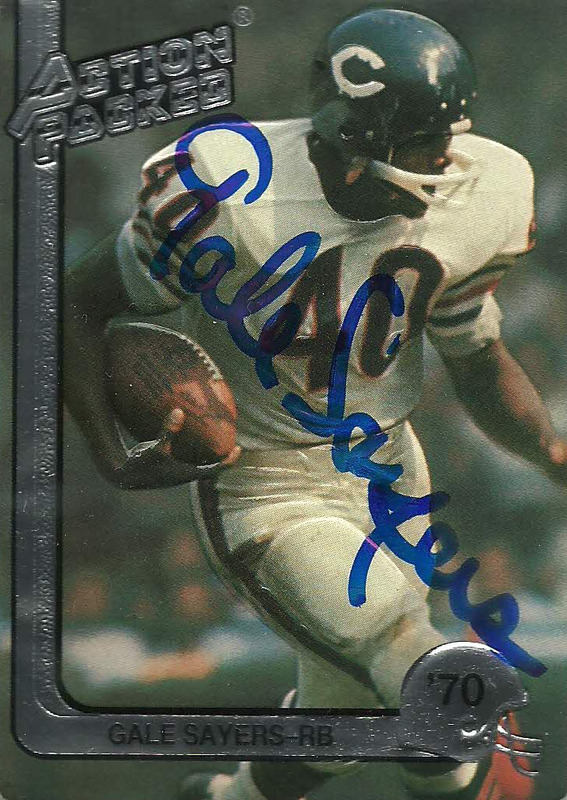 Gale Sayers is a former running back of the Chicago Bears from 1965-1971 who had a legendary career. The NFL rookie of the year had a record 22 touchdowns in his rookie year, 2,272 yards from scrimage, and tied the record for most TD’s in a game with 6. 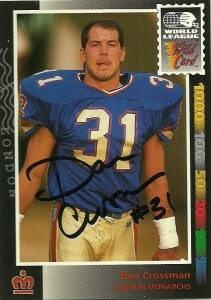 He would also set the record of 30.56 on kick returns on 91 returns, 6 of them going for touchdowns. Injuries ended Sayers career prematurely in 1971, and he would be elected to the HOF in 1977. 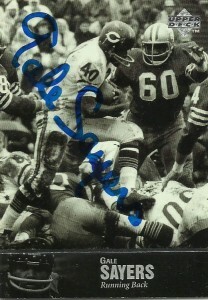 A 5 time All-Pro and 4 time Pro Bowl Selection, Sayers would be named the MVP of the Pro Bowl 3 times, to the NFL 75th Anniversary Team, and the 1960s all decade team. 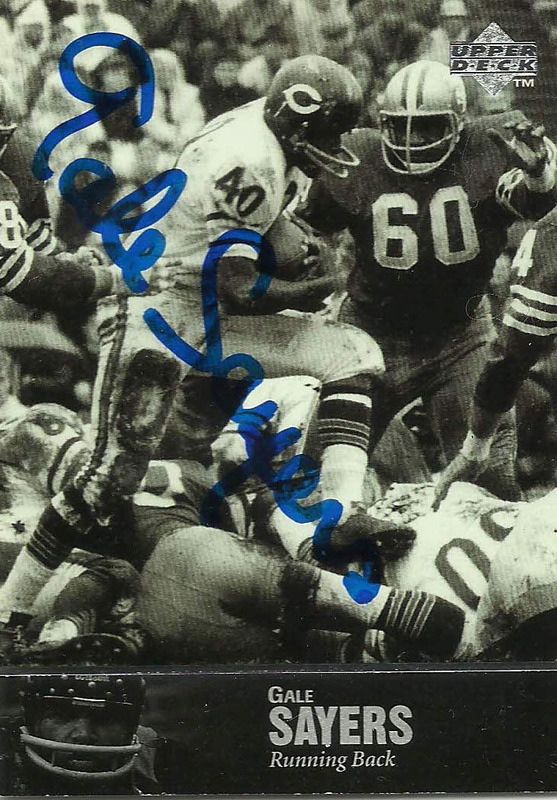 Sayers has had an extremely successful career after football, as he is Chairman of Sayers40 Inc, and an active fundraiser for the city of Chicago and the University of Kansas. 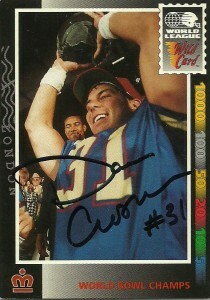 I sent Dan Crossman these four cards, and a photo from a game I attended. 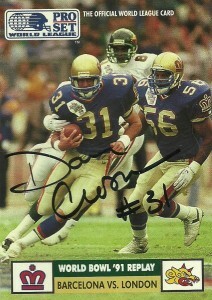 Responding to me in 9 days, he thanked me for being a fan and wished me luck in getting all the WLAF autographs I could. This kindness inspires me. 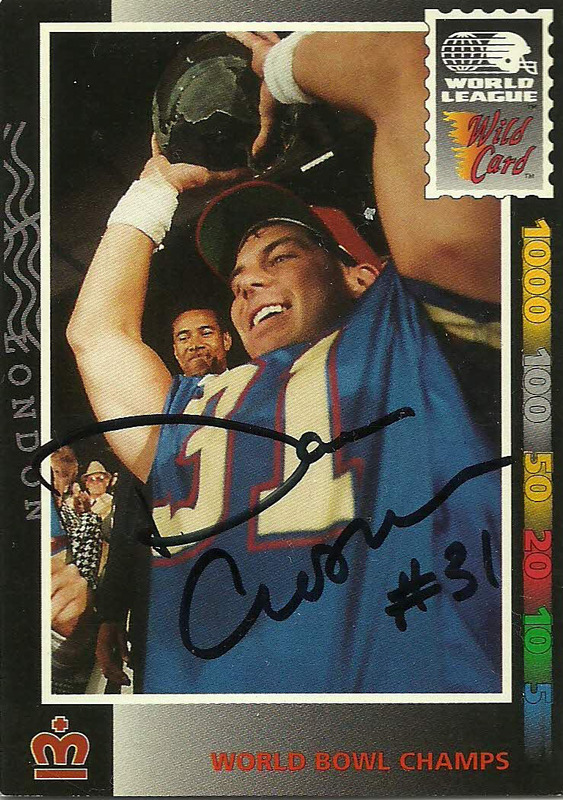 Dan Crossman played for the London Monarchs in the WLAF and won MVP honors for the first World Bowl in 1991 when the Monarchs beat the Dragons 21-0. Crossman was overshadowed all season by the rest of the members of the defense such as Dedrick Dodge and Corris Ervin, but Crossman made it count picking of Scott Erney 3 times in the game and returning one for a touchdown. After the game ABC caught up with Crossman who explained how they figured out Erney. Dan explained that Erney would look to TE Demetrius Davis frequently on a crossing pattern when Erney saw outside man coverage, so the Monarch secondary would switch from man to zone and slip a guy underneath. For receiving the MVP honors, Crossman also was given a bonus check and a brand new car. 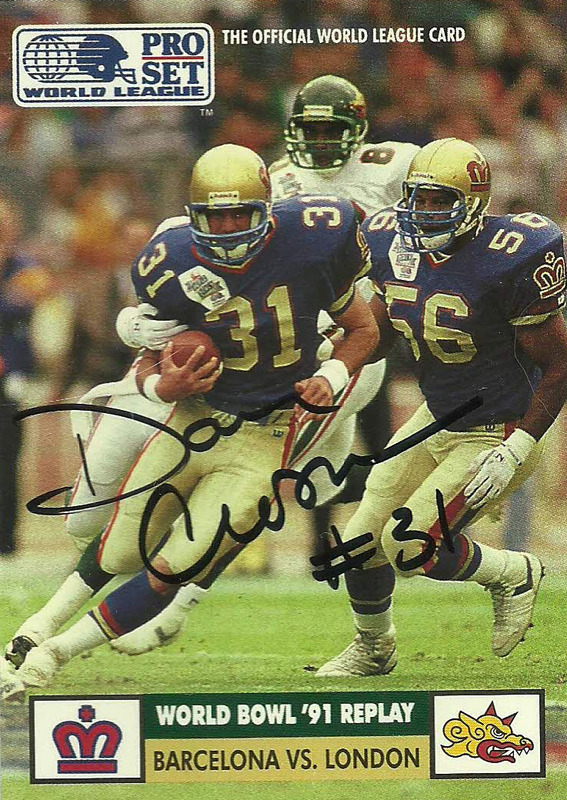 “Danny” would again return to the Monarchs in 1992 but the team would not fare as well, and the league soon after would be suspended for restructuring. 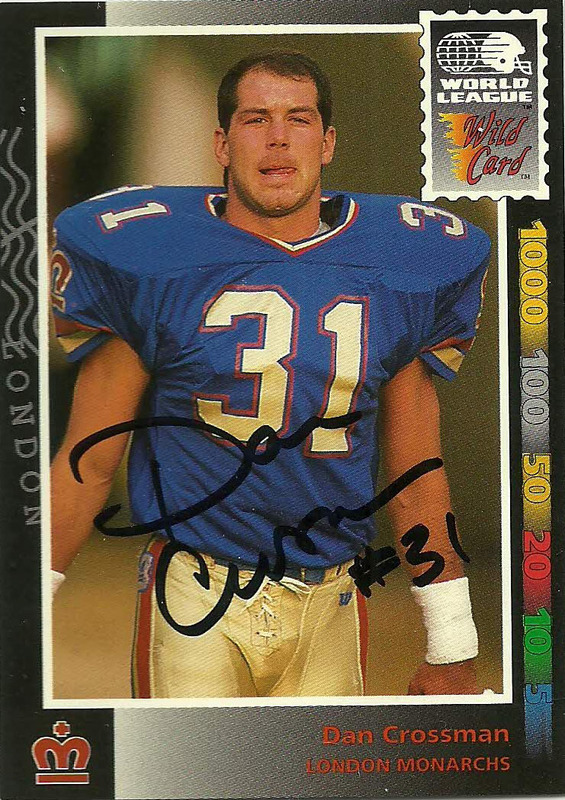 In 1993, Crossman began coaching in the college ranks and has since then risen to the NFL where at the time of this post he is coaching with the Detroit Lions. 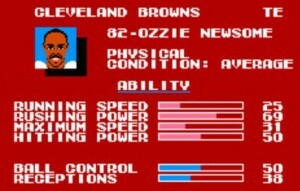 Ozzie Newsome and the Browns during the late 80’s began to have a more and more contentious relationship with Houston. While the Browns would claim that the Steelers were their true rivals, the Oilers snuck up on them starting in ’88, and under Glanville the two teams (and in fact the whole division for that matter) ignited a hated rivalry. 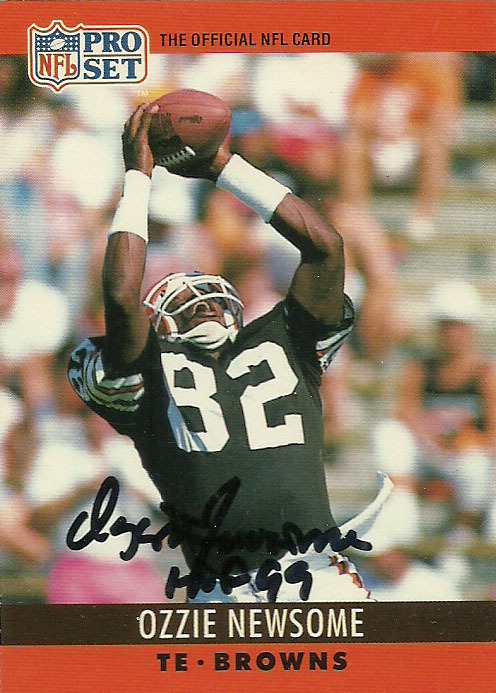 The Oilers and Browns would face up in the finale of 1988 and lose at Cleveland 28-23, then somehow hold on to win in Cleveland the next week in wildcard weekend 28-23. Newsome would always manage to keep his streak alive and ended up notching 150 straight games with a catch and retired at the end of 1990 after 13 seasons with the Browns. 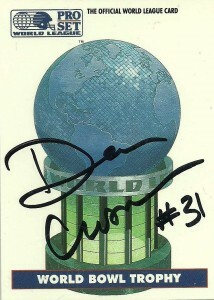 He was inducted into the HOF in 1999. Newsome moved with the Modell franchise to Baltimore where he has become an extremely successful general manager and the first black GM in the NFL for the Ravens.